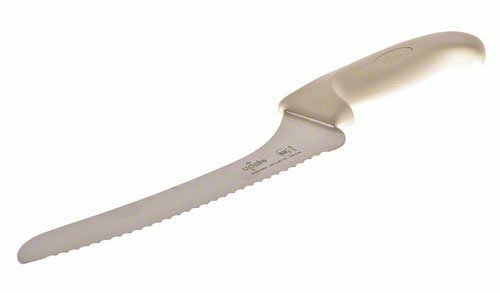 This professional grade cutlery offset bread knife is skillfully hand-honed to deliver the sharpest edge and maximum cutting performance. This knife is carefully manufactured of German high-carbon stainless steel with molybdenum vanadium. It is NSF listed. Available in 5-3/4-inch white handle. Blade measures 9-inch length by 1-inch width tapered. Measures 14-1/4-Inch overall length.